Ever since the introduction of the iPhone 3G S last Monday, there has been a lot of discussion on the Internet about what might be powering this significantly faster and more responsive phone. Even before the phone had been launched, in fact, the Internet had been abuzz with rumors that the new iPhone would feature a processor running at 600MHz and will come equipped with 256MB of RAM. 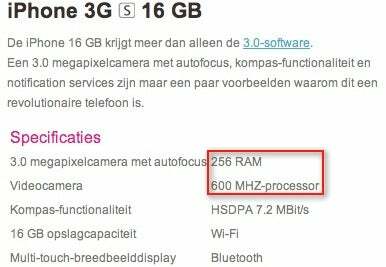 If a set of recently posted specifications for both the 16 and 32 GB variants of the iPhone 3G S on T-Mobile Netherlands’ website is to be believed, than those rumors have turned out to be true. T-Mobile confirms that the iPhone is indeed powered by a 600MHz processor (compared to the 412MHz processor of the iPhone 3G) and sports 256MB of RAM (versus 128MB on the iPhone 3G). As Macworld editorial director Jason Snell rightly opines though, the knowledge of what underlying technology the iPhone 3G S uses is hardly of any consequence for the regular iPhone user—and Apple would prefer to keep it that way. But apparently the Dutch have spoiled Apple's game.